The Diva Challenge this week is to use your MacNCheese tangle, or comfort tangle. Mine can vary from time to time, however I always get lost in Enyshou, even on a small Bijou tile (approximately 2 inches square). Today, in keeping with the 30 days of coloring challenge, I did mine in Rose Pigma micron and shaded with a CretaColor watercolor pencil. If you're viewing this from the card-making/coloring world, be sure to check out the Zentangle® world over at the Diva challenge, and if your a tangle fan, be sure to check out the coloring examples. I think you'll find they blend, hilight, compliment and contrast each other well just like any fascinating art piece! 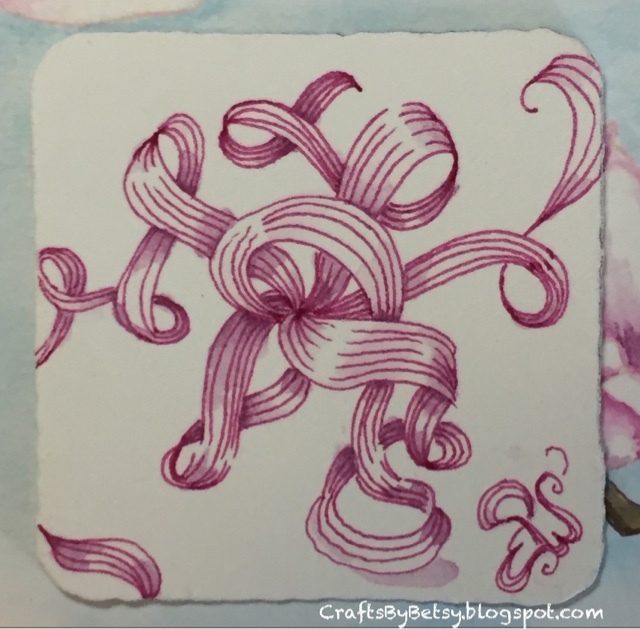 Pretty tile and I love the movement of this tangle. That's an interesting tangle to choose as a mac 'n cheese. I will have to go back and revisit it as this looks so flowing and lovely! Beautiful tile with wonderful color! Love it!